Advertisement for Part B, Steal This! My involvement with jewellery stems from the belief that jewellery can potentially provoke in the wearer and viewer a need for a response or interaction of some kind. I’m interested in the potential for dialogue that jewellery can open us up to, and its capacity to then act as a portable tool for the communication of ideas. The opportunity to develop work for an exhibition brief that sought to look at ways jewellery could prompt or instigate positive beneficial change in the community and society more generally back in 2010 then was right up my alley. My response to this brief led to the development of the Broaching Change Project. It formed part of a group exhibition titled Signs of Change: Jewellery Designed to Make a Better World that was associated with a Jewellers and Metalsmiths Group conference in Perth. 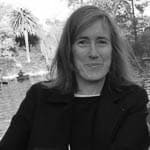 To meet the brief of the curators I developed a project that considered the idea that if Australia is one day to become a republic then a new style of gardening to accompany a new style of governing seemed possible. The work for the exhibition had the symbolic potential to promote the social value of gardens as reflecting notions of community, which is the essence of republicanism. The social aspects of gardening can be seen in Stephanie Alexander’s Kitchen Garden Program with its educational focus on teaching children about gardening and in the community orientated gardens of WWII Australia, when people were encouraged to plant vegetables due to food shortages. Engaging with ideas that might promote a model of gardening, whereby everyone in a micro community can share their specialist plants or produce with others in that small community for free with no requirements for reciprocity, seemed a good fit. The plants I chose to carry these ideas were personal: the oregano brooch represented culinary plants, the rose signified cut flowers and ornamentals, while the wattle symbolised trees. The image of a broken crown was juxtaposed with this plant imagery in each piece to reference the republican aspect of the concept inherent to the project. The pieces themselves were made from recycled brass (powder coated) from a local scrap yard and remnant plastic from the stationery industry, along with various threads. The project included an interactive element, a small but important evolutionary step in my practice. Those who wanted to be involved in the project signed up and the brooches were given out free at the end of the exhibition to three winners. Importantly, with ownership of a brooch each winner agreed to adhere to a covenant. This covenant stipulated that the wearer and owner must give the brooch to whoever admired it if they wanted it, and this beneficiary and temporary owner agreed in turn to do the same. A community could be built, where each owner was linked to the next. Temporary owners were also asked to comment on the project and process on an internet blog open to all. The WordPress blog had various sections to help guide owners and a small business card was designed to accompany each Broaching Change jewel whenever it was worn out or passed on. These cards outlined the covenants and listed the blog address. Situated within a participatory framework of socially engaged art that seeks to connect people together, the temporary owners of the Broaching Change jewels were asked to step outside the norms of conventional ownership and wearing to pass the brooches on. 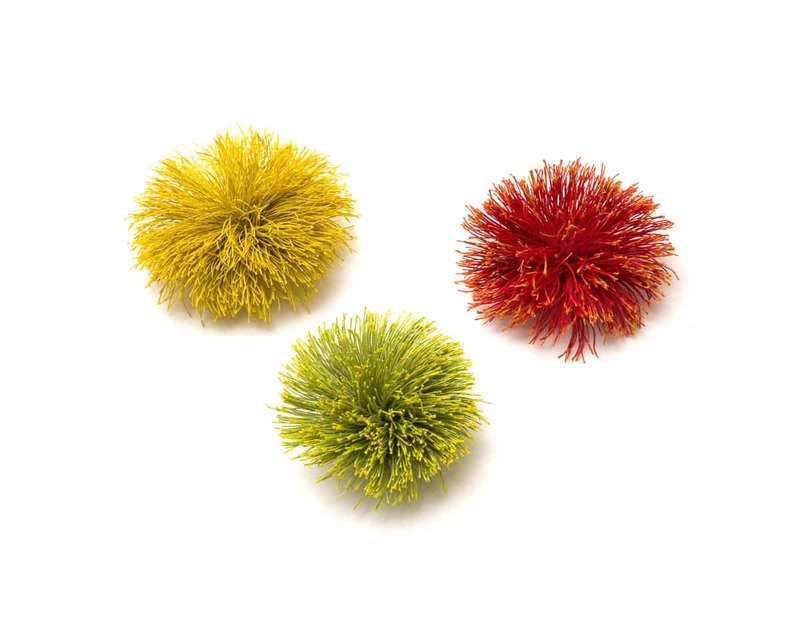 The brooches, designed to be available to everyone, were free of monetary constraints and in a sense, democratic. 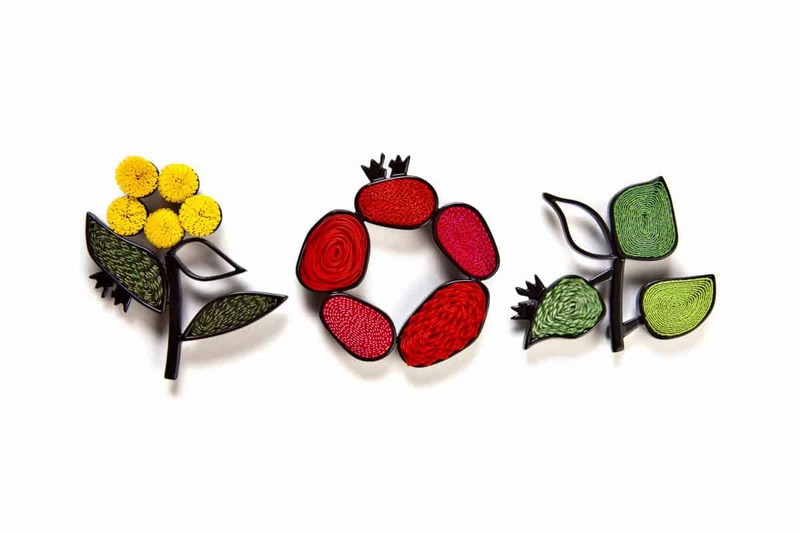 The brooches offered up other possible choices to individual consumption, tapping into sharing and gift economies as a way of promoting sustainable consumption and strengthening social ties. 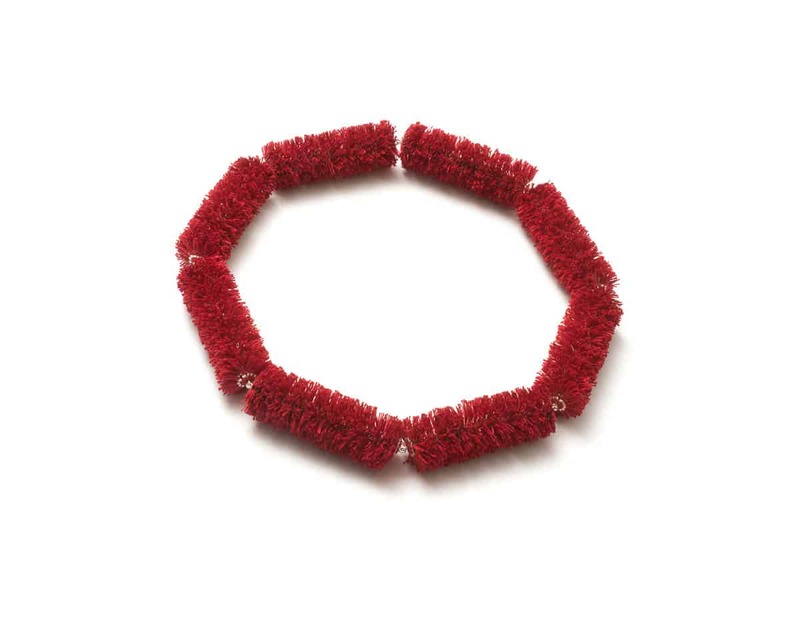 Many contemporary jewellers are increasingly interested in working within frameworks that seek to create interactions to link and connect people or to direct participants in performances and events, as well as transform traditional conventions of value and consumption attached to jewellery. Jewellery traditionally travels in market economies where hard currency measures value, but in jewellery projects such as Josephine Winther and Gitte Nygaard’s Makers Move project, no money changes hands as jewels are exchanged for stories. These artists see Makers Move as “a medium of exchange” where stories are traded for cast imprints of the public’s own special objects. These cast imprints (two are made, one for Makers Move and one for the owner) are then made into pendants that are exhibited alongside the stories. Similarly, no monetary transactions took place in 2012 in a Part B exhibition. 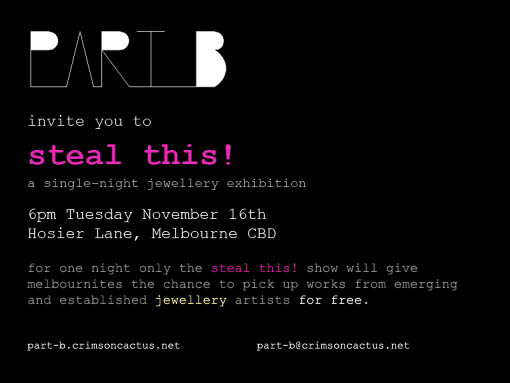 This jewellery collective ran ‘steal this!’, a one night project where the public was encouraged to take the handcrafted jewels they made and had displayed in a Melbourne laneway. They challenged their audience to help themselves to the jewels exhibited while simultaneously interacting with the makers of the jewels. 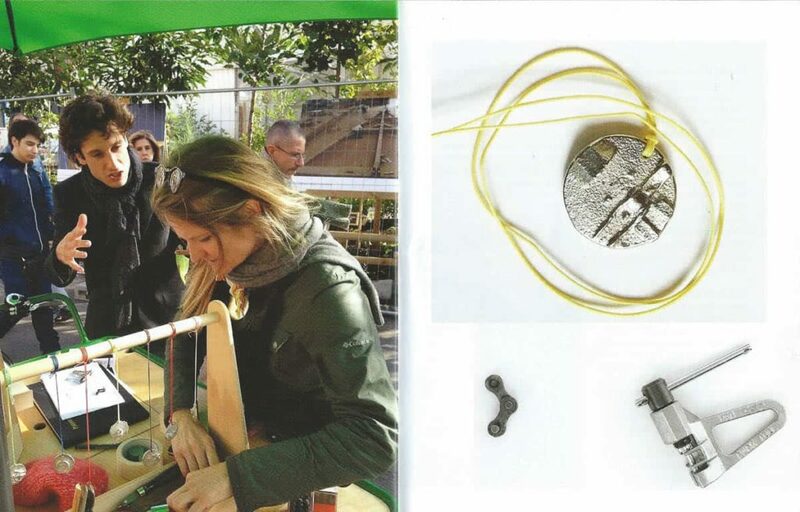 Projects such as the Ethical Metalsmiths’ (an American group) Radical Jewelry Makeover events also don’t involve money. Participants donate old unloved jewels which are then are recycled and upcycled into new works. They are then awarded credits for their donation and can use these credits towards purchasing something new. I make jewellery for money. I’m also equally interested in making work for love. Wandering into the no rules, no-man’s land of potential ideas where I can research and question something without the need for payment is a luxury, but one that helps sustain me. It’s time and money dependant. Broaching Change opened a space for me to create something that brought me into contact with people I didn’t know and I love that jewellery can do this. A tiny community was created, connected through social objects distributed outside the prevailing economic system and we could all rally for a moment against today’s dominant social force that is consumerism tied to the dollar. As a maker, it was liberating, fun, affirming and revealing all at once and when time, money, a good brief and solid idea come again there will be more free work and connections to be made.